Global M&A activity has continued at an impressive clip in 2018, with 15,349 completed deals worth a combined $2.4 trillion, according to Pitchbook’s 3Q 2018 M&A report. The latest quarter saw 5063 closed transactions valued at a total of $822.7bn. Across the first three quarters of 2018, total deal count was down 12 percent year-on-year – 2017 saw 17,435 deals completed – while deal value declined 7.5 percent. North America accounted for the highest proportion of deal value in over a decade, at 64.4 percent. The first three quarters of the year saw the region generate 8683 deals valued at $1.5 trillion. Furthermore, nine of the 10 largest deals of the year to date have targeted North American-based companies. European activity, by contrast, has been lacklustre. According to Pitchbook, the spectre of Brexit and ongoing concerns around the outlook for international trade,have led to a subdued dealmaking environment in the region. European M&A saw 5646 transactions valued at $809.1bn, a considerable decline from the 7973 deals recorded in the first three quarters of 2017 valued at a total of $1 trillion. Mega mergers – deals worth $5bn and above – were a notable feature of dealmaking activity in the first three quarters of the year. There were 45 mega mergers closed up to the end of Q3 and more notable mega mergers, including the $69bn merger between CVS Health and Aetna and the $50.6bn Comcast/Sky UK deal yet to close. The private equity industry has also become increasingly influential of late. PE firms accounted for 33.3 percent of all M&A activity through the first three quarter of the year with many firms interested in sourcing deals through divestments. The report also highlights developments in the oil & gas space where the record levels of activity recorded in 2017 fell away in the first three quarters of 2018. 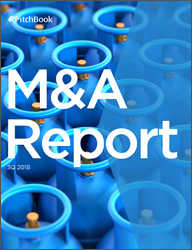 Oil & gas companies pursued 350 M&A deals valued at a combined $125.6bn to the end of Q3 2018, a decline of 23.6 percent and 49.1 percent respectively, from the first three quarters of 2017. There were still some notable deal closures during the period, however, with Concho Resource’s $9.5bn purchase of RSP Permain the most noteworthy in the space.